At 30 years of age I had never done a sun holiday!! As kids we always went to the south of Ireland, and as I got older my holidays were usually city breaks to the likes of London,Liverpool, Berlin or New York . This year however myself and my college friend Aine decided for our 30th Birthdays to do a winter sun break. To say I was excited was an understatement. The chosen destination was Puerto Del Carmen, Lanzerote. I brought my new Fujifilm X-A10 with me for the trip. I wasn’t intending taking too many pictures, the main aim of the trip was to completely unwind and relax, however the scenery was too beautiful not to photograph. We stayed in the Las Adelfas apartments and I cant recommend them enough. We had a 2 bedroom newly refurbished apartment, with 2 balconies overlooking the pool and bar area. The apartments were only a 2minute walk to the beach: Playa de los Pocillos. The main shopping and restaurant area known as the strip was about 5minutes walk from the apartment and stretched all the way into old town which was about 50/60mins walk. The first day was spent on the beach soaking up the sun!!! 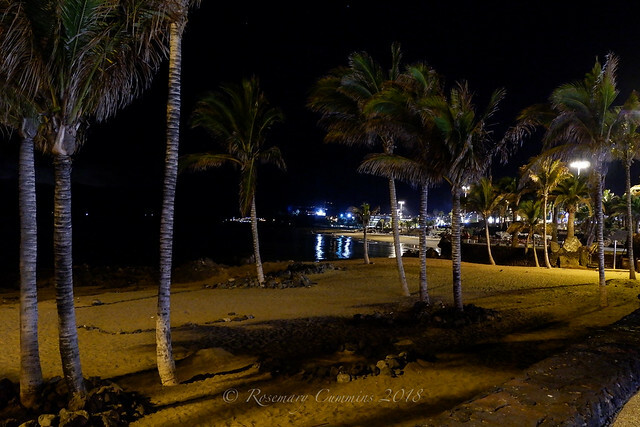 the second day however we wandered into old town Puerto Del Carmen. There is a lovely marina there and the water was so clear you could see the bottom. Its a lovely place to stroll around and grab a bite to eat. On our 3rd day in Lanzarote we took a bus tour around the south of the Island. This tour brought us to the small village of Yaiza, where we stopped for some food and met up with the bus from Playa Blanca. We then continued on to the volcanic national park of Timanfaya. Timanfaya national park is a sight to be seen. I would highly recommend taking a bus tour to it. If you are travelling to the park by car be prepared to wait around 2 hours for entry. The busses get priority and we bypassed the queue of cars waiting. This was in November which would be a much quieter time of the year so I can only imagine what it would be like in the height of the holiday season. The volcano is still technically active. The tour guide only had to go 30cm below ground level to find volcanic rock so hot you got hard to hold them in your hand. They then proceeded to throw hay down into a hole which promptly took light. Another demonstration was where the guide poured water down a vent which then was shot back out within seconds as steam. All these demonstrations showed that the volcano is still very much active beneath the surface. While at the visitors centre you could see chickens being cooked over an open pit, heated by the volcano below. We also got to go on camel rides at the foot of the volcanoes. This was an amazing experience. We had such a laugh as it started to rain about 5minutes into the 20 minute camel ride. It rained for the duration of the 20minutes. Luckily this was the only rain we saw on the trip. The tour of the South Island ended with wine tasting. Wine is one of the main industries on the island. Due to the volcanic landscape there is little or no growth on the south of the Island. Grapes however were found to grow quite well in the volcanic soil due to the porous nature of the soil it holds the moisture at nighttime and provides the right conditions of the grapes to grow. Our last full day on the Island was spent soaking up more sun and some much needed vitamin D.
I would highly recommend Lanzarote for a winter getaway. We went the second week of November and the temperatures were still in the early 20s. It was perfect for getting some colour and sitting out enjoying your meals. Browse through the album below for more pictures from the trip.